Here’s a quick guide that will teach you how to adjust bike brakes in just a few minutes. Learning how to adjust bike brakes is important as this is something that should be done on a routine basis. Making sure your brakes are properly set up is not only important for safety reasons, but it also gives you the confidence to ride at your best. Knowing that you can stop very quickly at any given moment allows you to test your limits. The resistance of the brake handle lever determines how well you can push the brakes. This can be optimized by adjusting the cables that connect to the brakes. You’ll need to tune the length of these cables to suit your needs. If you have too much resistance, it will be really hard to push down on them. On the other hand, if you have too little, the brakes will be too responsive. You need an Allen wrench (have a 4mm, 5mm and 6mm handy) for the adjustment. Find the brake cable fixing bolt and loosen the bolt to tighten or loosen the cable. Test your brake handles with the brakes to ensure that you’ve found a setting that meets your needs. After the adjustment, screw the brake cable fixing bolt back again. Sometimes, you might be facing a situation where too much of the cable is put into the actual brake handle. This can be due to a fall or crash and will have loosened the cable connecting to the handle end or pushed too much of it in. To make the adjustment for this, simply loosen the lock nut on your brake handles. 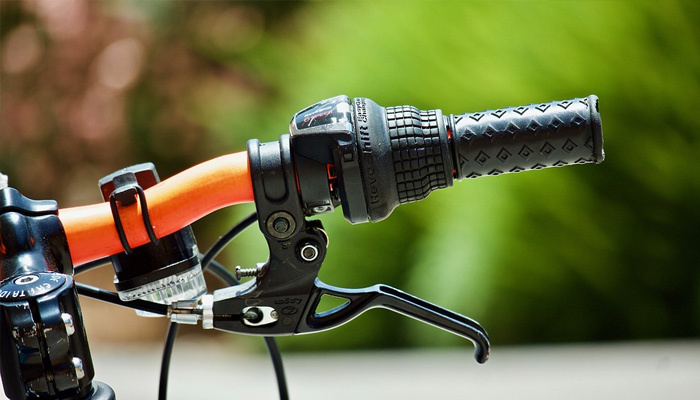 This will remove the tightening of the handlebars and allow you to readjust the cables. If you find too much of the cable has been stripped, you can simply cut away the top part if you have extra cable length. This will be followed by screwing back the lock nut with the wire back in place. For a final adjustment of your brakes, you can play around with the barrel adjusters. This will change the resistance of your brake handles slightly to tweak them to your preference. The most important part of learning how to adjust bike brakes is ensuring that your brake pads are routinely maintained. Start by looking at your brake pads and ensuring that they’re not worn down. You’ll obviously need new ones installed if they are. Given that the brake pads are still usable, you’ll want to test how they are working by squeezing your brake handles. Check where the pads are being applied to. Ideally, they should be working on the center of your wheel rim. If they are working on the tire or not aligned with the rim of your wheels, they are in need of adjustment. Take an Allen wrench and loosen the bolt that fixes the brake pads in place (this is also how you’d replace brake pads). Adjust the brake pads so they are aligned with the rim. It should be on a slight tilt and not perfectly horizontal. Once aligned, tighten the bolt back. It is time to test your brakes again to see if the pads are being applied to the rim properly. If you look at your brake pads, you might notice that there is a pair of them installed to provide fast and even braking. However, brake pads can go out of the center and cause inconsistencies in braking. This can be identified by fluttering during braking, resistance when you pedal, or simply one side being worn faster than the other. The solution to this problem is to center your brake pads. Start by taking your Phillips screwdriver and finding the tension screw on the brakes. Loosen the screw so that you can center the brakes. All you’ll need to do is to look at the brakes to see if you need to move them more to the left or right. After centering the brakes, tighten the screw back again. Push your brake handles to see that the brake pads are being applied at the same time and evenly. 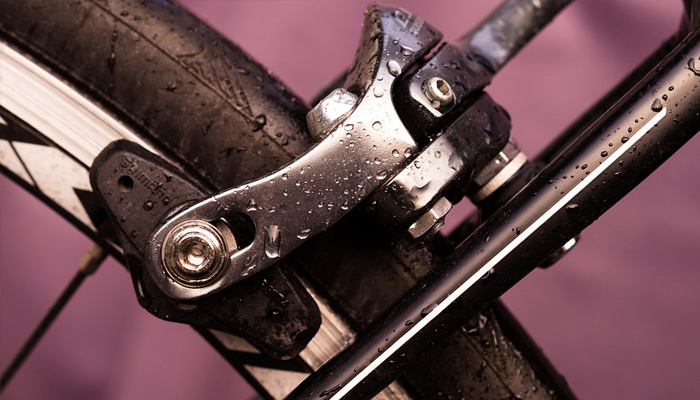 While you’ve learned how to adjust bike brakes, it’s important that you also stress the importance of making sure that the brake parts are fit to be used. If the brake cable wires have been stripped and do not hold grip, you’ll need to install a set of new ones. If any of the screws on the brakes are starting to rust, you’ll want to replace them immediately. Letting it rust for too long will result in you not being able to fit the Allen keys or screwdrivers to turn the knob. Of course, you’ll also want to replace brake pads if they have been worn out. Manufacturers will have markers to indicate when the pads have been too worn. Making sure that these replaceable parts are well maintained will play a huge role in safety. Do not overlook maintenance as you want to get more mileage out of the parts or you don’t want to spend the extra money. That wraps up our guide on how to adjust bike brakes. You’ll have realized by now that making these small adjustments is not as complicated as you may have originally thought. It will require a few basic tools and a few minutes of your time. And most of the time, the adjustments that are needed end up being fairly minor. 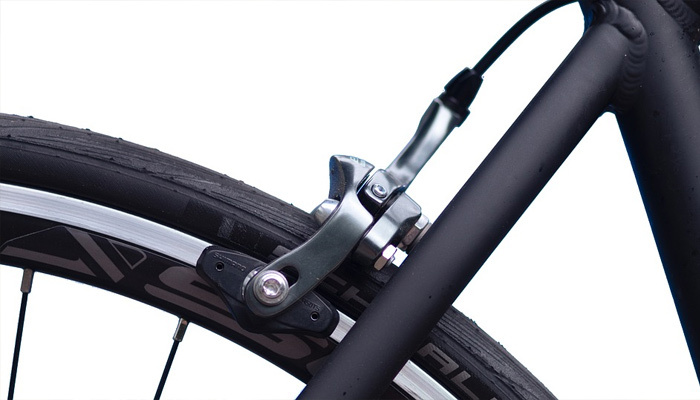 Now that you know how to adjust bike brakes, be sure to practice your knowledge often. Bike brakes will need constant adjustments as the road conditions and intensity of your riding may move things around. Proper maintenance is not only important for safety, but it’ll also allow you to perform at your best.